What is the size of that crater? It was shown in satellite images to have eaten a piece of the coastline! Estimate from a screenshot if no source exists. Since it was at the sea, of course the crater is filled with.... duh, seawater. 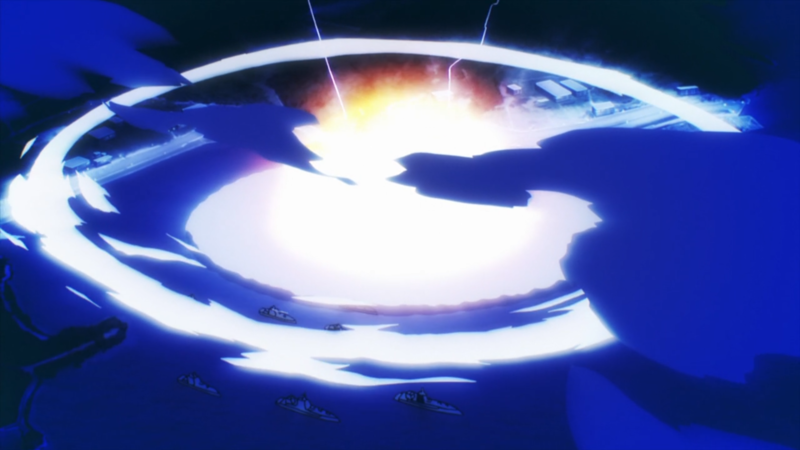 So by the images of episode 26, how big was the blast Ooguro caused? The easiest solution to this would be if the light novels gave us a concise answer, but of course, nothing in life is that easy. Repeating Kazama's order, Tatsuya pulled the trigger on Third Eye.From within Tsushima Base, across the strait, directly into Zhènhai Naval Port. Tatsuya's magic transformed 1 kg of matter directly into energy. In accordance with Einstein's Formula, the heat energy equated to approximately 20,000,000 tons of TNT. Now using this, we can approximately calculate a blast radius. Given this information, we can assume that the simulation is roughly 90% accurate, giving an error margin of ±10%. Setting the yield as 20,000 kilotons, with an airburst of 17m (the beam height of a typical modern Chinese ship, or the height at which the flag would be flying) leaves us with a result of a crater diameter of 2100m, which, accounting for error, could be anywhere between 1890m and 2310m. As for the blast itself, the simulation lists the fireball as having a diameter of 6400m, which following the previous error margins could be between 5760m and 7040m. These and other statistics are all from the simulation and are viewable upon following this link. In the picture below, the blast is still only just beginning, and if we assume the ships in the shot are the same length as a typical modern Chinese ship (~155m), these numbers seem definitely feasible. TL;DR: The crater would be approximately 2.1km across. Granted, this simulation is for a nuclear blast and not a mass of pure energy, but since the energy released is the same, the results should be more or less equivalent.